Background: Under current European Union legislation, two severe hypoglycemic events within 12 months is grounds for driving license withdrawal. The aim of the study reported here was to determine whether fear of such a withdrawal could lead to patients concealing severe hypoglycemia from physicians, which could negatively impact further treatment decisions. Methods: A total of 663 patients with insulin-treated diabetes were anonymously surveyed about whether they would conceal severe hypoglycemic events from their physicians, if revealing them could result in driving license withdrawal. This investigation utilized an adapted and expanded questionnaire by Graveling et al. Results: Of all diabetic patients surveyed, 26.17% would most likely not report hypoglycemia, and 25.86% were undecided. In a group of patients with type 1 diabetes, 31.83% would likely not report hypoglycemic events, and 25.06% were undecided. The patients least likely to report severe hypoglycemic events were those who indicated that vehicles were partly essential for work, and who also had more than two hypoglycemic events monthly. Conclusion: A considerable percentage of diabetic patients would likely conceal severe hypoglycemic events from their physicians due to fear of driving license withdrawal. Patient failure to report severe hypoglycemic events can potentially lead to physicians being misinformed regarding the patient’s condition, which could lead to inadequate monitoring and treatment. Acquisition of a driving license is an important right of European Union citizens. Some diseases, such as diabetes, can limit that right. In the case of diabetes, recurrent severe hypoglycemic (SH) events are one factor that increases the risk of driving accidents.1,2 In 2012, the Czech Republic adopted a new amendment (to harmonize European Union legislation) which significantly restricted the rights of diabetic patients with recurrent hypoglycemia to hold a license.3,4 For Group 1 drivers (personal vehicles), two SH events within 12 months is now grounds to revoke a driving license or deny its issuance. The new amendment also requires physicians to inform the appropriate authority when they suspect long-term or acute-care patients of having a reduced ability to hold a driving license. Considering the importance of transportation, both personal and professional, one can assume that a certain proportion of patients with diabetes would not report SH events to their physicians, due to fear of driving license revocation. This could lead to misinformed treatments with potentially fatal consequences. The aim of this study was (through means of an anonymous questionnaire) to determine what percentage of patients would potentially conceal SH events from physicians, and attempt to define their characteristics. The study was approved by the Ethics Committee of the Charles University Second Medical Faculty in Prague (approval date: January 1, 2015, EK-55/15). Five specialized diabetic clinics invited patients with insulin-treated type 1 and type 2 diabetes to complete an 86-item survey, which had been supplemented and adapted from a questionnaire by Graveling et al.5 The questionnaire was offered, in the form of a web application, to all insulin-treated diabetic patients enrolled at these centers. Due to the sensitive nature of the questions, the research was dependent upon respondents’ trust, and any breach of this trust could have distorted their responses. Therefore, the questionnaire was strictly anonymous and excluded questions that could have been interpreted as a threat to privacy. An episode characterized by symptoms typical of hypoglycemia and requiring assistance of another person to actively administer carbohydrates, glucagon, or take other corrective actions.6 Even though patient education regarding hypoglycemia is part of the standard treatment of diabetic patients in the Czech Republic, the concept of SH and its negative impact (both in general, and with respect to driving a motor vehicle) was still included in the questionnaire. In the event that I experienced severe hypoglycemia, I would inform my physician, even though my driving license could be revoked. Diabetic patients who have experienced severe hypoglycemia should notify their physician, even though it could result in driving license revocation. Of the 912 diabetic patients invited, 663 (72.7%) participated. We analyzed 663 questionnaires from diabetic patients (443 with type 1; and 220 with type 2) who were either treated with insulin, or a combination of insulin and oral antidiabetic drugs. The mean patient age was 42.0±16.3 years (430 men, 233 women) and the mean diabetes duration was 17.2±10.2 years. An aggregate of responses from insulin-treated type 1 and type 2 diabetic patients to Statement 1 indicated that: 78 patients (12.15%) would definitely conceal the event, 90 (14.02%) would most likely conceal it, 166 (25.86%) were undecided, 180 (28.04%) would most likely report it, and 128 (19.94%) would definitely report it. Response to Statement 1 relative to type 1 diabetic patients: 68 patients (15.35%) would definitely conceal the event, 73 (16.48%) would most likely conceal it, 111 (25.06%) were undecided, 121 (27.31%) would most likely report it, and 70 (15.80%) would definitely report it. Response to Statement 1 relative to type 2 diabetic patients: eleven patients (5.50%) would definitely conceal the event, 17 (8.50%) would most likely conceal it, 55 (27.50%) were undecided, 59 (29.50%) would most likely report it, and 58 (29.00%) would definitely report it (Table 1). 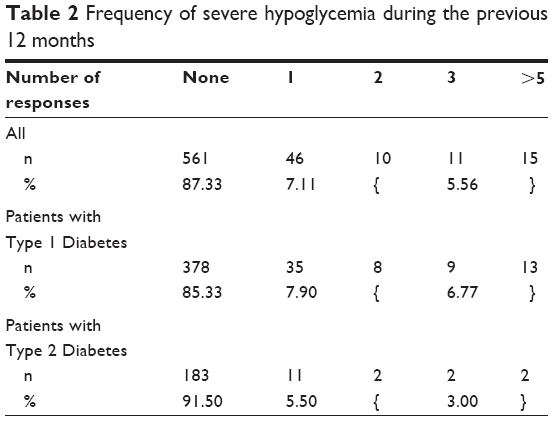 In terms of reporting SH events, a highly statistically significant difference was observed between type 1 and type 2 diabetic patients (P<0.0001): type 1 patients had a 0.42 probability of concealment; type 2 patients had a 0.19 probability. No significant difference was observed between male and female type 1 patients when comparing the probability of reporting these events (P=0.2979). No differences were found between the responses to Statements 1 and 2. For 205 (32.4%) respondents, driving a vehicle was essential to their employment; for 123 (19.4%), it was partly essential; and 305 (48.2%) did not need a vehicle for their employment. The CART technique suggested that those least likely to report SH events were those who indicated that vehicles were partly essential for work, and who also had more than two hypoglycemic events monthly. In this group, the probability of concealment was 0.647; in the remainder it was 0.353, which was a highly significant difference (P<0.0001). Of the total number of study participants, 36 patients (5.56%) reported two or more SH events during the previous 12 months, while 46 patients (7.11%) reported one SH event. In the type 1 diabetes group, 30 patients (6.77%) reported two or more SH events during the previous 12 months, and 35 (7.90%) reported one SH event. In the type 2 diabetes group, six patients (3.00%) reported two or more SH events during the previous 12 months, and eleven (5.50%) reported one SH event (Table 2). According to the results of this study, 26.17% of potentially affected insulin-treated diabetic patients would definitely not report, or would likely not report, SH events to physicians under the present legislation, and a further 25.86% were undecided. Since SH events are primarily an indication of serious errors in patient self-management, its presence is always a signal for 1) reeducation, 2) the use of specific monitoring devices (eg, a continuous glucose monitor), or 3) changes in therapy itself. Patient failure to report SH events can, therefore, potentially lead to physicians being misinformed regarding the patient’s condition, which could lead to inadequate monitoring and treatment. A study that used the current wording of the amendment with patients who participated in the Diabetes Control and Complications Trial reported that 30% of patients met the conditions for license withdrawal at least once during the course of the study itself.12 Considering that the Diabetes Control and Complications Trial followed patients for 9 years, the patient-reported frequency of two SH events within the previous 12 months, as found in our study, suggests that (at a minimum) an equal percentage of patients in the Czech Republic could be at risk of driving license revocation. The CART analysis suggested that significant reasons for not reporting SH events were the requirement of a vehicle for employment and more than two hypoglycemic episodes per month. This result emphasizes the difficulty faced by patients when deciding to report SH events: choosing to pursue additional treatment could result in the loss of their driving license. Strict revocation of a driving license after two SH events within 12 months is understandable as an effort to reduce accidents involving diabetic patients.13 However, threat of revocation may lead to many patients concealing SH events, which could lead to suboptimal treatment and circumvent the original intent of the amendment. We must now decide if allowing greater physician discretion regarding SH events and reporting ineligibility can address the previously mentioned problems without prejudice to the fundamental objective of the amendment (ie, minimizing the risk of accidents in connection with hypoglycemia). In the Czech Republic, standard education for all diabetic patients includes the risks of driving with hypoglycemia (eg, potential accidents) as well as information concerning possible driving license revocation or suspension in the event of two SH events within 12 months. Our results indicate that patient education should also include warnings regarding the risk of SH event concealment, given that such concealment could prevent patients from receiving alternative therapies that could potentially resolve the issue. Increased patient awareness could also be achieved with the help of patient organizations and related campaigns. This study was supported by the project of the Ministry of Health, Czech Republic, for conceptual development of research organization (00064203: Motol Teaching Hospital, Prague, Czech Republic). Cox DJ, Gonder-Frederick LA, Kovatchev BP, Julian DM, Clarke WL. Progressive hypoglycemia’s impact on driving simulation performance. Occurrence, awareness and correction. Diabetes Care. 2011;23(2):163–170. Cox DJ, Ford D, Gonder-Frederick L, et al. Driving mishaps among individuals with type 1 diabetes: a prospective study. Diabetes Care. 2009;32(12):2177–2180. European Union (EU). Commission Directive 2009/112/EC of 25 August 2009 amending Council Directive 91/439/EEC on driving licences. Official Journal of the European Union. 2009;L223:26–30. EU. Commission Directive 2009/113/EC of 25 August 2009 amending Directive 2006/126/EC of the European Parliament and of the council on driving licences. Official Journal of the European Union. 2009; L 223:31–35. Graveling AJ, Warren RE, Frier BM. Hypoglycaemia and driving in people with insulin-treated diabetes: adherence to recommendations for avoidance. Diabetic Med. 2004; 21:1014–1019. Jamieson S. Likert scales: how to (ab)use them. Med Educ. 2004; 38(12):1217–1218. Hastie T, Tibshirani R, Friedman JH. The Elements of Statistical Learning: Data Mining, Inference and Prediction. 2nd ed. New York, NY: Springer; 2009. Wood SN. Generalized Additive Models: An Introduction with R. London: Chapman & Hall; 2006. Breiman L, Friedman JH, Olshen RA, Stone CJ. Classification and Regression Trees. Belmont, CA: Wadsworth; 1984. R Core Team. R: A language and environment for statistical computing. Vienna: R Foundation for Statistical Computing; 2014. Available from https://cran.r-project.org. Accessed February 18, 2015. Kilpatrick ES, Rigby AS, Warren RE, Atkin SL. Implications of new European Union driving regulations on patients with Type 1 diabetes who participated in the Diabetes Control and Complications Trial. Diabetic Med. 2013;30(5):511–636. Inkster B, Frier BM. Diabetes and driving. Diabetes Obes Metab. 2013;15(9):775–783.